The bloc’s five most senior leaders are calling for a common deposit guarantee scheme for euro zone banks. That would push EU harmonisation forward – a much needed tonic with Greece on the brink of an exit. Yet political suspicion over fiscal transfers may still muddy their rosy vision. 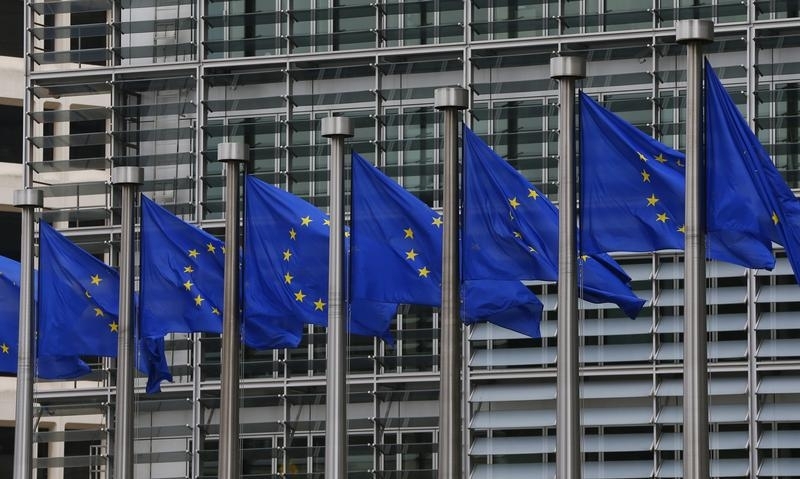 European flags are seen outside the European Commission headquarters in Brussels September 10, 2014. Europe should agree a common deposit insurance scheme by 2017, according to a report published on June 22 by the so-called five presidents on euro zone integration. The paper highlighted common deposit insurance as a necessary step for completing the euro zone’s banking union, which involves central regulation of banks, and common rules for winding down failing lenders. The current system of national deposit schemes “remains vulnerable to large local shocks,” the report said. A common scheme would “increase the resilience against future crisis” and would also reduce the costs of deposit insurance. The report was authored by Jean-Claude Juncker, president of the European Commission; Donald Tusk, president of the European Council; Mario Draghi, president of the European Central Bank; Jeroen Dijsselbloem, president of the Eurogroup of finance ministers; and Martin Schulz, president of the European Parliament.